marlene b. creative: Sidecar of Substitutions. When limitations bind you it is creativity that allows you to overcome. After learning about Demerara sugar syrup and reading the Pouring Ribbons’ Sidecar recipe in the New York Times I was determined to make it myself so I set out to find the ingredients. This is where the “limitations” part comes in. Finding specialty food items is challenging where we are in Japan, close to Tokyo but not close enough to have metropolitan conveniences. First, the Demerara sugar syrup. According to Wikipiedia, Demerara sugar is simply a “natural” form of brown sugar, like turbinado. Surprisingly, the local commissary had Sugar in the Raw, which is turbinado, so I bought that along with some light brown sugar to add a bit more lovely, molasses richness. I made a batch of the syrup with one cup of water, 1 ½ cups of turbinado sugar, and ½ cup of brown sugar melted together over low heat. It is a delicious, dark, simple syrup and will keep in the refrigerator for quite a while in an air-tight bottle. Next, acquiring the alcohols. Since I know nothing about Cognac and our immediate selection is incredibly limited, I simply bought a tiny bottle of Hennessy, which happens to have two ounces. I knew Curaçao would be a long shot and forget about orange bitters. There is a large liquor store about twenty minutes away but I have precious little experience driving here (right-side driver on left-side roads) and was not going to test my skills on a rainy, Sunday afternoon. I was a bit bummed because I was also looking for rye whisky, sweet Vermouth, and sherry, not today’s priority though. 1. 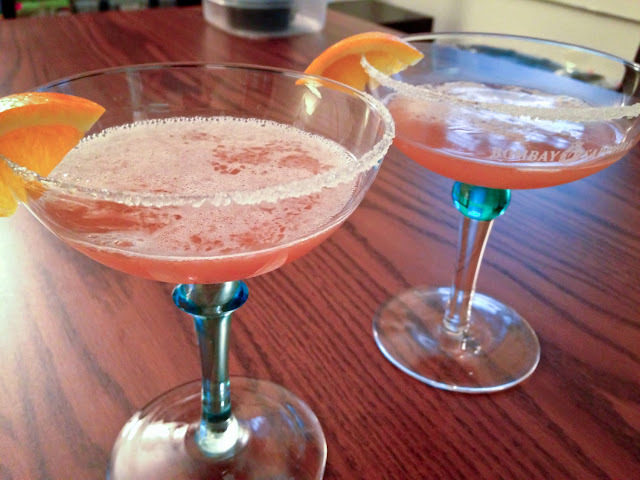 Rub orange slice around half the outer rim of a coupe glass. Place sugar in a small dish. Holding glass parallel to dish, coat with sugar only the half you’ve rubbed with the orange. Set aside. 2. Combine simple syrup, cognac, Cointreau, lemon juice and Campari in a cocktail shaker. Add ice, then cover, shake and strain into the sugared glass. Garnish with an orange and enjoy. The Sauce is the Star. New Tool for Black and White.